This was part of the menu of the very first cooking class I taught in 2008. It remains a favorite. Whether much of it makes it into a dish–of pasta, eggs, beans or simply spread on toast–remains a question. By the spoonful at the counter, however. . .
Use hazelnuts, walnuts or even toasted pumpkin seeds if you don’t have almonds. And substitute Parmesan or an aged Asiago if you don’t have Pecorino. To blanch kale, bring a pot of water to a boil. Drop chopped kale in and blanch for about 30 seconds, drain well and let cool. In a mortar and pestle crush garlic to a puree with a pinch of salt or mash into a paste with the side of chef’s knife straight on your cutting board. 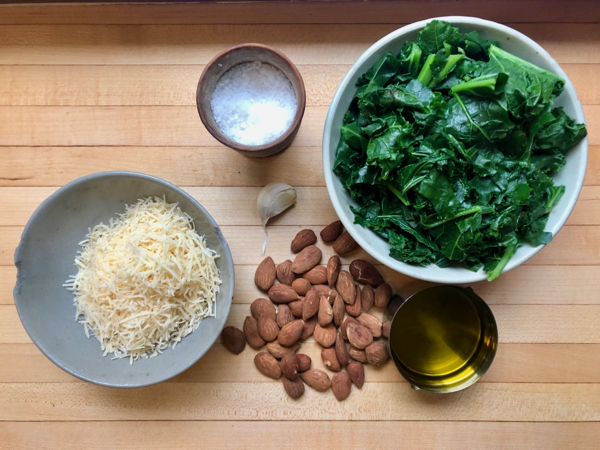 Put almonds in a food processor along with the garlic. Pulse to finely chop. Remove from processor. Add kale and pulse to finely chop. Add back almonds and garlic then let run while pouring olive oil through the feed tube. Remove from processor to a bowl, stir in Pecorino and season with salt and pepper, to taste. 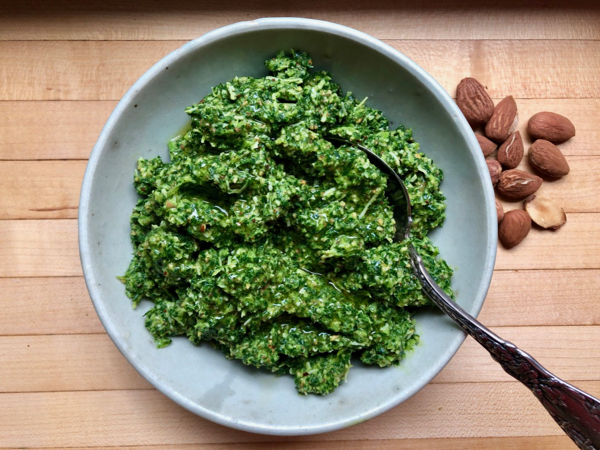 Toss with pasta (be sure to reserve 1/3 cup of cooking water) to loosen pesto and coat pasta, stir into eggs or beans, spread on toast or sandwiches. It’s also delicious with grilled or baked salmon.